Rural hospitals on average have done better at avoiding the spread of hospital-acquired conditions and have scored higher in Medicare's value-based purchasing program than their urban counterparts. Last year only 288, or 34% of rural hospitals participating in the hospital value-based purchasing program, faced financial penalties compared to 1,040 or 49% of urban hospitals, according to a new report released Wednesday. Under the program, acute-care hospitals are rewarded or penalized depending on the quality of care. Similarly rural hospitals performed well under the hospital-acquired-condition reduction program that aims to prevent conditions like pressure sores and hip fractures after surgery. 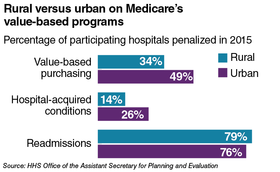 Only 129, or 14% of rural hospitals evaluated under the effort faced a penalty versus 568, or 26% of urban hospitals. Rural hospitals are also more likely to do better in care coordination models as they often share a physical space with outpatient and nursing home facilities. In urban areas, that type of consolidation may be seen as anti-competitive, the CMS said. “In payment models that reward such coordination and place increasing focus on efficiency and collaborative care, rural hospitals may be poised to perform particularly well,” the report said. One area in which rural hospitals did not do better compared to urban areas, however, is readmissions. Last year 709, or 79%, of rural hospitals evaluated under the hospital readmissions-reduction program were hit with a financial penalty versus 1,902 or 76% of urban hospitals. The report didn't identify the reason for the difference, but did note adults living in nonmetropolitan areas have poorer health, higher rates of tobacco use and major chronic conditions and poorer indicators of oral and mental health. Recently, there's also been a spike in morbidity and mortality because of the opioid epidemic disproportionately affecting rural Americans. The CMS wants to find ways to improve the quality of care in rural communities. On Wednesday, it hosted its first-ever rural summit at its headquarters in Baltimore.